Progress towards a clear goal. A goal that has worth. A goal that is personal. In other words, success is action that moves someone towards the accomplishment of goals that have been thought through and have great personal value to the person working towards them. It’s simple stuff but you wouldn’t believe how many teams and organisations do not have really clear goals, with step-by-step action plans, that allow all members of that team or organisation to exert their best efforts in achieving them, knowing why achieving those goals has a personal benefit to them as well as the company. That is why goals are so important and why we work with all our clients to clarify their goals. It’s powerful stuff! More than one in three employees report that their level of trust in senior managers is weak (34%), while an overwhelming majority report that they trust in their colleagues and line managers to some or a great extent (92% and 80% respectively). That’s according to the latest research by the CIPD, the professional body for HR and people development, which is concerned about a counterproductive ‘them and us’ mentality breeding in too many of the UK’s workplaces. This week we saw the beginning of a very exciting new project, working with a national manufacturing company to achieve their goal of achieving the Investors In People standard. Our pilot group involves 8 managers from across the business, with varying levels of seniority, undertaking the LMI Effective Leadership Development programme. Plans are already afoot to enrol the senior management team in the Effective Motivational Leadership programme, with the intention to involve all managers in this transformational initiative during 2014. What has been especially encouraging for this new client of ours has been the degree to which the LMI ‘Total Leader’ solution so closely mirrors the requirements of the IIP standard, and their own empowering leadership ethos. All this points towards a very fruitful, long-term partnership. I look forward to share more news on this in the near future as LMI’s unique services continue to make a big impact for our UK clients. The Financial Services and Manufacturing industries have the weakest leaders in the UK, according to a detailed study released this morning by Head Heart + Brain, a leadership development consultancy. To gauge the standard of leadership in different industries, Head Heart + Brain commissioned a poll of more than 2,000 people which asked UK workers questions about their bosses based on the key criteria of what makes a good leader. These criteria are derived from the principles of neuroscience, which shape how effectively people lead in the workplace. The index measured various factors – from the amount of autonomy employees are given and the clarity and openness of communication about job responsibilities and targets to the quality of feedback and the fairness of leadership. But by far the most important factor the index analysed was how well leaders help employees understand change – and their part in making it successful. When Head Heart + Brain asked employees in organisations where some difficult change had occurred over the last six months, “How much does your leader help you understand the change and your role in making it successful?” leaders in the Financial Services sector came out at the bottom of the list – just 11% of employees said their leaders had made a big effort to help them understand the change and their role in making it successful. The $5m (£3.2m) prize is supposed to be awarded each year to an elected leader who governed well, raised living standards and then left office. This is the fourth time in five years there has been no winner. A committee member said the group looked “for excellence in governance but in leadership also”. Kenya’s Mwai Kibaki met at least one of the criteria, after he stepped down as president earlier this year. However, his 2007 re-election was tarnished by disputes which turned violent, leading to the deaths of some 1,200 people. His opponent, Raila Odinga, said the poll had been rigged in favour of Mr Kibaki, who denied any wrongdoing. Three people have won in the seven years since the prize was launched: Cape Verde’s Pedro Verona Pires; Festus Mogae from Botswana and Mozambique’s Joaquim Chissano. 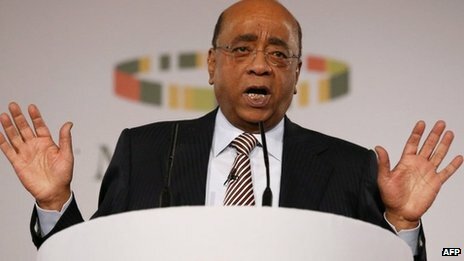 Sudan-born telecoms entrepreneur Mr Ibrahim launched the prize in an attempt to encourage African leaders to leave power peacefully. Do you reward or even recognise great Leadership in your Organisation. It is a rare ability and one that needs nurturing and developing.